Free Shipping on $75, otherwise $5 Flat Rate. No code required. 11 Webkinz for $37 shipped! Webkinz Pets are lovable 8.5" (approx.) plush pets that each come with a unique Secret Code. They have a LIMITED SUPPLY of these, so if you want some, order quickly! It's our Biggest Sale yet! For a limited time, get baseball cap deals and additional savings on NCAA, NFL, NBA, MLB and NHL clearance hats and clearance apparel. Free Shipping to Store near you, otherwise $4.95 Flat Rate shipping or Free Shipping to home when spend $50. 6pm Deals! ASICS, Keen, Clearance Deals in Shoes and Clothing! All orders ship for just $6.95! ASICS up to 70% off! Plaid select styles $50 or less! The Flexx, Fly Flot and Patrizia up to75% off! Creative Recreation select styles $34.95 or less! 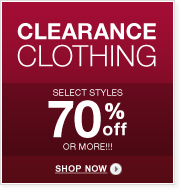 Clearance clothing select styles 70% off or more! 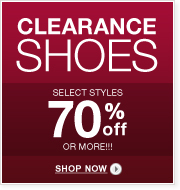 Clearance shoes select styles 70% off or more! Add the following to your cart and then add coupon code: 444411 and the flat iron will be FREE @ checkout! You will need to add a filler item (like bobby pins) to bring your order over $50 and get the free shipping. *some exclusions apply (including Levi's).